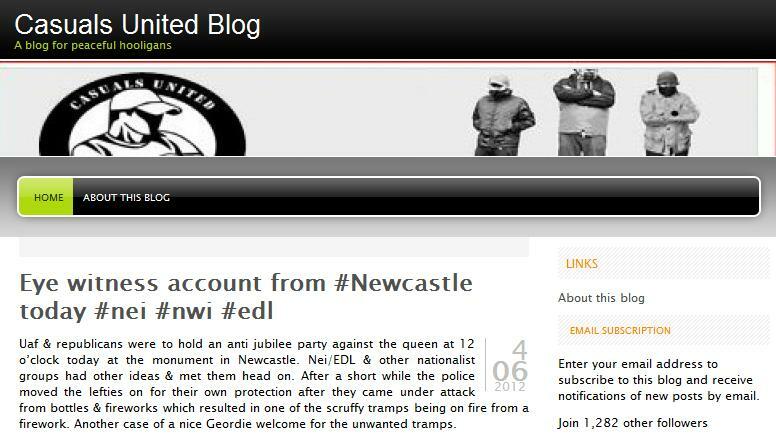 The EDL have delightedly posted a link to a Sky news report of their members attacking a “Stuff the Jubilee party” in Newcastle earlier today. This despite a clear statement in the report that “Nazi salutes and chants” were directed against the anti-Jubilee protestors by the EDL. There is also video footage of an EDL supporter throwing a firecracker, which apparently hit one of the anti-Jubilee crowd, burning his hair, much to the pleasure of his attackers, who admitted in gloating Facebook comments to throwing bottles as well. 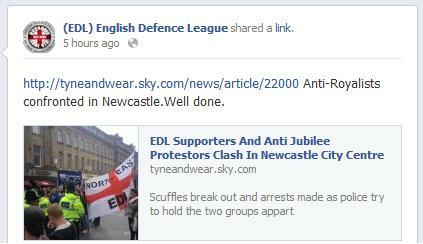 The EDL’s football hooligan division, Casuals United, has posted a short report too, making no attempt to hide the fact that the EDL organised the demonstration in co-operation with the Infidels breakaway group, with whom the EDL had supposedly severed links due to the Infidels’ neo-Nazi sympathies. 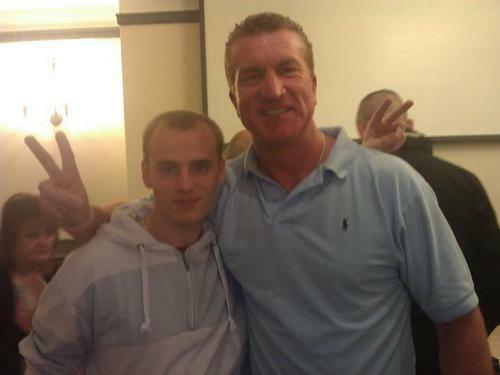 Hope Not Hate reports that the EDL and Infidels met up at a Newcastle pub before going on to join a contingent from the National Front led by “veteran far right bonehead Simon Biggs”. 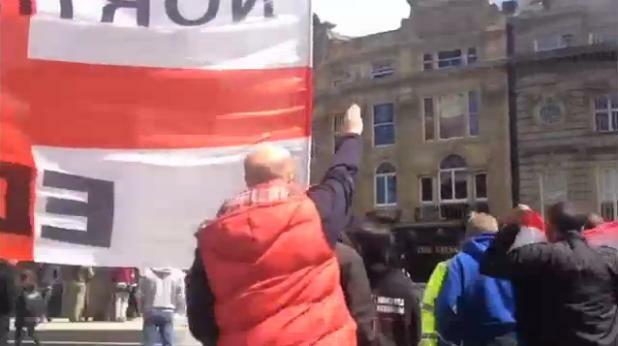 HNH’s reporter also spotted another notorious Nazi, Kevin Watmough of Redwatch, on the demonstration. 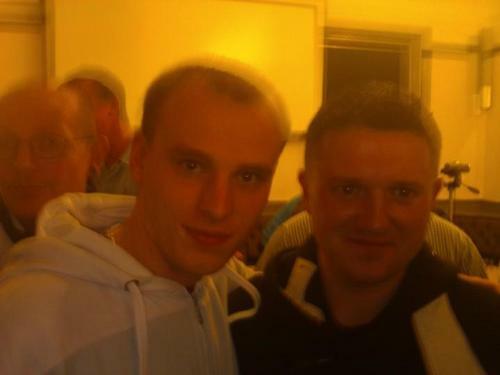 HNH notes that Mark Walls of the Infidels “appeared very friendly with the rival EDL leader Alan Spence, who has only recently been released from prison”. Spence, you may remember, is a former BNP parliamentary candidate who received a seven months’ sentence for his part in a 2010 attack by the EDL on the Tyneside Irish Centre, where the Socialist Workers Party was due to hold a meeting. 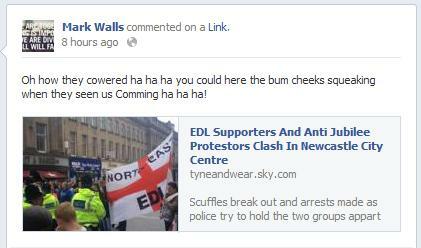 Based on Facebook comments, one of the Infidels’ supporters involved in the Newcastle confrontation was an individual who goes by the pseudonym of Sir-Northeast Markio. His real name is Mark Turnbull, and he is a former BNP member from Gateshead who was in court back in 2010 following violence at an EDL demonstration in Leicester. 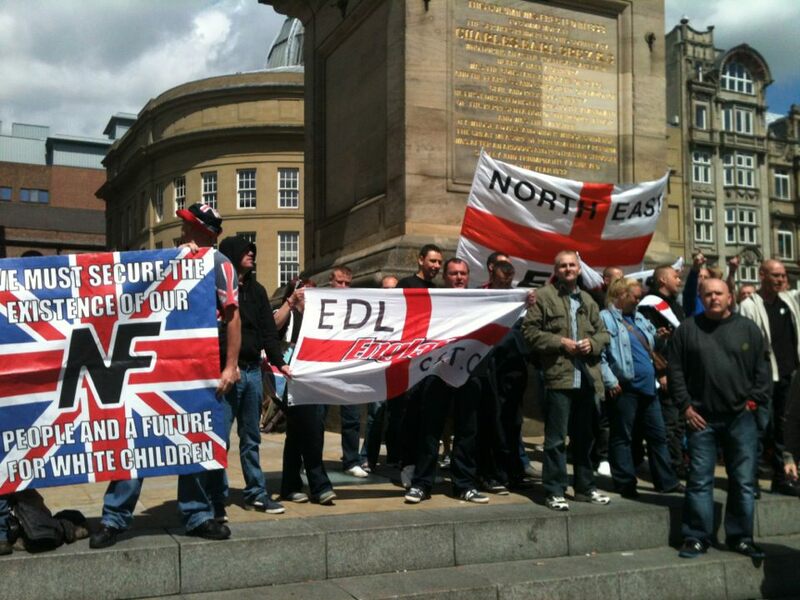 The EDL’s claim that they are not part of the far right, but are merely a non-violent human rights movement whose aim is limited to peacefully protesting against Muslim extremists, is so laughable that you wonder why they insist on holding themselves up to ridicule by continuing to repeat these lies. Meanwhile, over at the EDL website, we are told it is a mark of a civilised society that minorities have the right to express their opinions freely, and “we should be concerned whenever someone refuses to subscribe to the principles of civilized discussion by, for example, threatening their critics with violence”. Unless, of course, the minority in question fails to share the prevailing view about the monarchy and the people offering violence are the EDL.